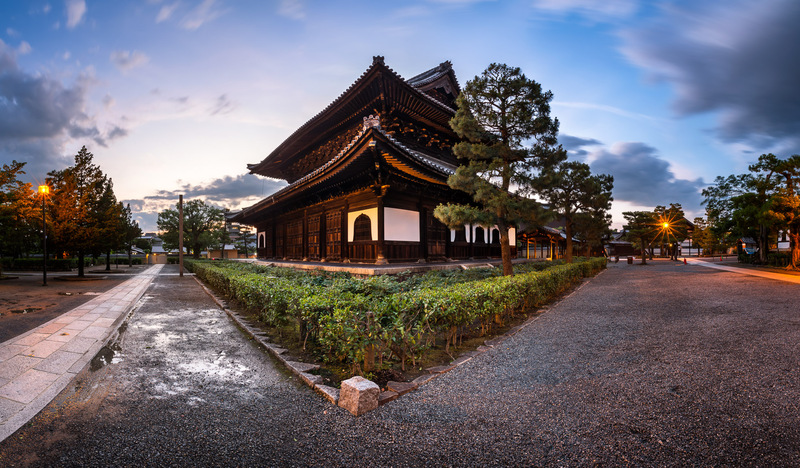 Founded in 1202, Kenninji Temple is the oldest Zen temple in Kyoto. Yousai, the founder of Kenninji, made the voyage to China twice during his lifetime, the first time to pursue Tendai studies and the second time with an intention to reach India. Although his voyage to India has failed because of political situation in Central Asia, he was able to come into contact with the Zen sect, which was at its height at the time in China. As a result Yousai introduced Zen sect in Kenninji Temple and brought tea ceremony into Japan. I arrived to Kenninji Temple in the evening and it was already rather dark. I didn’t have any time to investigate the place and I quickly setup my tripod near the corner of the temple Main Hall. I used panoramic technique to create dynamic ultra wide-angle composition. June 2015, panorama from 3 vertical images, additional exposures for highlights, focal length 16mm, aperture f/11, shutter speed 8 seconds, ISO 100, tripod, pano head. This entry was posted in City and tagged Japan, Kyoto.